I am just saying it would be better timing to share it after the studying time is over. Or use the hiding option just like others have been doing in this thread. It’s kind of amazing how different the analyses can be. I treated this as a shape problem, but I appear to be alone in that feeling after browsing other analyses. I don’t think I would have found the pro move, though I can never know for sure, since I chose the game. LeelaZero liked the counterattacking move I thought was heavy for Black. I understand the temptation to find the answer by looking up the game or sending it through a bot. You should just realize that the journey is going to be a lot more beneficial than finding the answer. Looking up answers can reveal gaps in our identification of candidate moves, but it won’t help develop our analytical skills, which is really what this exercise is all about. I think that’s exactly what happened, the participants shared their thoughts before looking up the game. My personal interpretation is that B13 plays a key role in this position. This is what, as you say, will help black “plant her feet” on the side if needed. I also posted a variation (or rather a question). i think this was a case where a proverb got in the way. “Dont push from behind” hammering in the back of my head kept me from giving J8 a fair chance. looking back at it, i stand by my original verdict (i cant really see where it would lead in the centre) but i can also see why it could be good. if white struggles too much, securing a base will become urgent. Board 3 is up. Please share your analysis if you want to practice with us. I am at a loss here. I really want to put N10 to work but I can’t get a decent result. My choice: back to the bottom left and wait for better times. The Q12 aji would later support a bottom right invasion. Next board will be an older game. Others are welcome to post boards, too, so long as some time has gone by and there’s been sufficient engagement with the current board. Thanks @mark5000 ! I think we had a nice study group here and I enjoyed reading others’ analysis. I added a variation to your comments. Personally I thought P10 was a natural shape move to consider, even if not a first choice. I actually considered the game sequence but it didn’t make sense before settling the lower right corner. I am really worried about the fate of the lower left. My take is that it is the new spirit, and at this point white is willing to sacrifice all 4 stones if needed. My E3 was a bad choice anyway, as we now know F2 is the proper local move. Board 4 is up. Please have a look at this classic game and share your analysis. Also note that komi is 5.5, in case that affects your analysis. note that komi is 5.5, in case that affects your analysis. I can’t think about anything else than G11. Really. Other moves around C15, Q8 or S4 look big but not as urgent. The timing doesn’t feel right for directly going after the two stones in the middle. I think I want to build the side in a way which applies light pressure to them, and ask white what their next move is. If white responds by strengthening the two stones, I can take another big move somewhere else. If white responds by trying to reduce the outside/tenuki, I can build thickness elsewhere and then come back and attack the two stones, later. Assuming that tenuki would be unreasonable for white after E13, (is it? ), why doesn’t black tenuki after white responds? Regardless of white’s move, there isn’t much in terms of territorial potential for white in the center. Making the side big with something like G3 seems like it puts white in the awkward position of deciding if/how to reduce black without seriously hurting the light stones in the center. This is certainly a possibility. But then if you don’t plan to pressure white, maybe E13 is not not so urgent either and we’re back to @mark5000 's analysis. I’ll take this opportunity to mention that I really liked your move at D10 when I read your analysis. 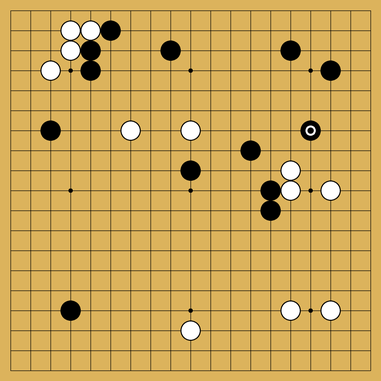 Leela Zero gives it a very good score (still below G3). I initially thought that G11 was too close to play to the centre group, failing to take profit elsewhere, but it stood up well to my brief analysis. The cap at K5 really caught my eye. I liked the concept of pressuring White from afar in order to greatly increase the zone of attack. All in all, this is the move I’d play. 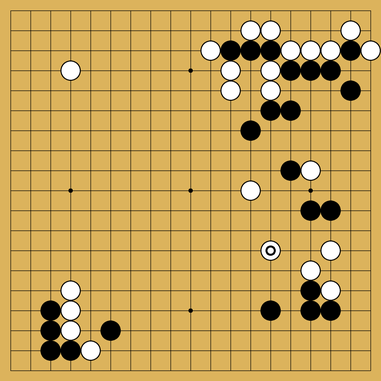 The calmest idea I found for Black was the shimari at C6. It still attacks the centre group but doesn’t make any ostentation about it, simply developing Black’s position. On the other side of the coin, a move I liked for White was P14, which sneaks into Black’s top-centre moyo and offers to perhaps sacrifice the centre group whilst strolling in from one or more safe groups on the outside. When I was analysing, I was reminded of a passage of advice attributed to Honinbo Jowa which sometimes taps me on the shoulder. In it (amongst other things) he criticises running with groups, making statements like “running groups away will make you cowardly” and “if you have invaded too deeply, you must sacrifice your stones.” So I wondered how sound an idea that would be for White and how (as Black) I would go about playing against it. By the way, great idea, Mark.